Fuel-efficient Power Volvo Penta IPS - Inboard Performance System - is a revolutionary propulsion system. With dramatically increased efficiency, Volvo Penta IPS offers fast acceleration, quiet running and significantly reduced fuel consumption. Two Cabins accommodation below consist of a master stateroom with island bed, alomost 2m headroom and generous cupboard and hanging space. The guest cabin features an athwartships double bed as well as a single bed running fore and aft. Expansive Saloon... It's all here, helm, lounge and galley. Specification is high. The soft leather L-shaped lounge is inviting. The feeling of being in control at the helm is compelling, the moulded dash is akin to a luxury European car. Central Galley On the same level as the cockpit and saloon, and cool thanks to air-conditioning in the saloon, you'll cook up a feast with features such as microwave oven, cooktop, fridge/freezer, sink with faucet, and significant bench. Indoor-Outdoor The huge rear window and door between cockpit and saloon, are a revelation. Stylish, in tinted glass and polished S/S frame, the opening creates the ultimate indoor-outdoor feel. The two areas just flow into one. Contrasting Décor Impressive are the subtle colour contrasts of the headliner and light beech timber. Details such as the fabric concealing the speakers and the silver trim of the cabinetry, certainly catch the eye. 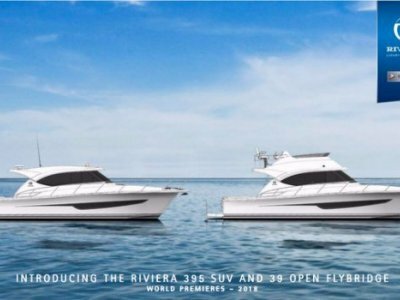 Innovation Personified Practical features like Amtico flooring, transom mouldings, gas struts on hatches, panoramic windows, CD/DVD player and a 22" LCD TV, offer insight into Riviera's commitment to luxury. 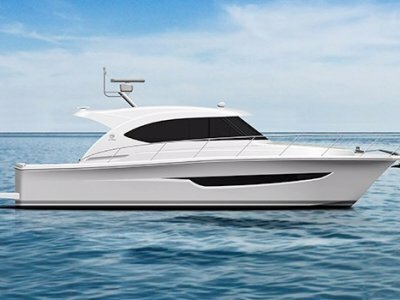 A Fresh New Style, a Fabulous New Boating Experience. Every now and then a work of art or piece of design comes along that is more than an evolution of what came before - it is a quantum leap in thinking and execution. The Riviera Sport Yacht is such a leap. The vision for this new style of boat was inspired by decades of experience in markets as diverse as Australia, Europe and the USA. 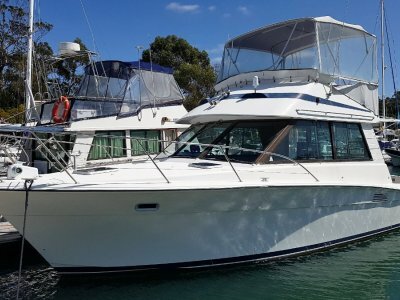 Riviera realised that today there was a need for a boat that was both solid and dignified in the tradition of our Flybridge Convertibles, yet spirited and contemporary in the same vein as our Sport Cruisers. The result might best be described as a serious motor yacht with a refreshingly light and sporty side. Starting from a blank canvas gave us the opportunity to address the needs of today's boat owner like never before. Drawing on contemporary architecture, automotive styling, fashion, leading furniture design and other sources we have created a boat of impeccable style and one that is utterly modern. Everything about the Sport Yacht is designed to make life on the water easy, relaxed and fun. most awarded pleasure boat builder, Riviera. A company with over 29 years boat building experience and owners of the largest pleasure boat building facility in the Southern Hemisphere. from the international boating community and been the recipient of multiple 'Boat of the Year Awards'. If you are in search of a new boat that captures your heart and inspires your soul, your search is over. One of the most striking features of the Sport Yacht is the huge rear window and door between the cockpit and saloon. Not only is it extremely stylish with tinted glass set in a bold, highly polished stainless steel frame, it opens up to create the ultimate indoor-outdoor feeling. The two areas just flow into one to produce a unique al fresco experience. The fact that the galley is on the same level as the cockpit and saloon also means that the chef remains in the middle of the party. The galley is just a step away from the cockpit and for entertaining there is a second refrigerator here. At every turn you will find Riviera ingenuity - such as the flat screen television in the saloon that raises and lowers out of sight at the touch of a button, the way the stainless steel swim ladder folds away, and the discreetly placed drink holders on the foredeck sunpad. As for comfort, the large L-shaped lounge with its soft leather and deep cushions is probably more inviting than the couch in your living room. Yes, easy living and an idyllic environment to share leisure time with your family and friends. 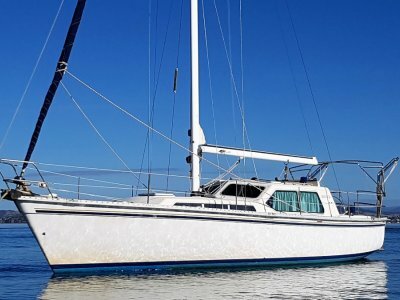 But this is a boat of real substance too, one that boasts the most sophisticated design and construction methods including a hand-laid solid fibreglass hull with separate compartments throughout the hull and a watertight collision bulkhead forward. The 3600SY is powered by the inspired Volvo Penta IPS pod drive system that is exceptionally smooth and quiet whilst unbelieveably responsive and fuel-efficient. This may be a new style of motor yacht but the quality and superior technology tells you that it is every inch a Riviera. Style or good taste may be hard to define but you instantly recognise it when you see it... And you will see it here in abundance. It's in everything from the subtle colour contrasts of the plush headliner material to the use of a light cherry timber with a satin finish. Even details such as the fabric concealing the saloon speakers and the stylish airconditioning vents have been carefully considered and beautifully executed. Of course, style goes beyond looks in that it is functional as well as fashionable - the practicality of the Amtico flooring is an example here. And style has a feel to it: the solid feeling you get when you step aboard, the diameter of the hand rails, the moulding of the transom locker, the extensive use of gas struts on hatches that makes for easier, safer operation. Again and again you will find yourself saying, "That's clever... That's thoughtful... That's well finished. " That's why you will find yourself saying, "I want a Riviera Sport Yacht. " The sense of light and space aboard the 3600SY is extraordinary (in fact the 3600SY is over 38 feet in overall length). The panoramic windows, uncluttered layout and the use of lighter timbers and innovative materials all contribute to an interior that's just perfect for relaxed, fun-filled days and laid-back, indulgent nights. All your creature comforts are catered for including a quality on-board entertainment system featuring a CD/DVD player and a flat screen LCD television. The feeling of being in control as you sit at the helm is magnificent. For a start, you have such clear, sweeping views - and the moulded dash, reminiscent of a luxury European car, displays all instruments and controls in the most ergonomic fashion. Even a novice will find this a remarkably easy vessel to handle. Accommodation consists of a master stateroom with a large island bed, 6' 7" feet headroom, and generous cupboard and hanging space. The full beam guest cabin with a double and single bed is extremely well appointed and luxuriously comfortable. Even the bathroom echoes the same interior style and finesse with its solid surface vanity top, sink, quality fittings and a shower stall with glass partition. If ever there was a craft that epitomises Riviera's pursuit of quality and represents our sheer creativity, this is it. 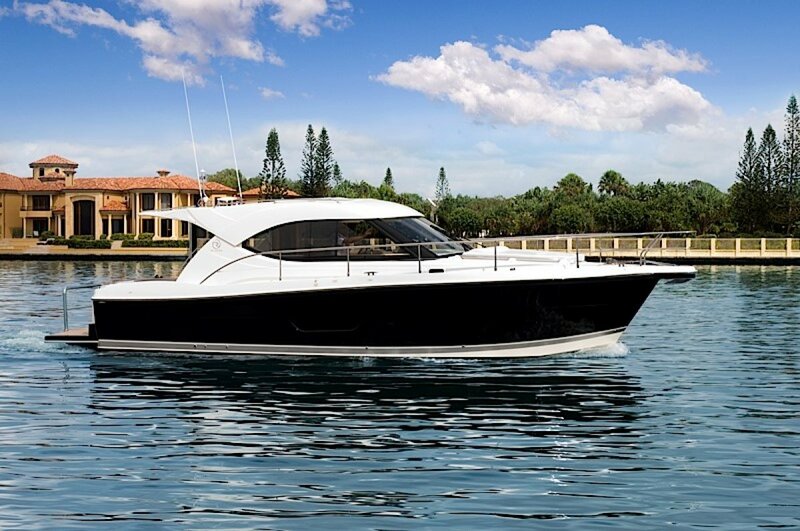 If you are looking for an entirely new boating experience, we welcome you aboard the 3600 Sport Yacht.